Graeme John Lloyd (born 9 April 1967) is an Australian former professional baseball pitcher, who played for the Milwaukee Brewers, New York Yankees, Toronto Blue Jays, Montreal Expos, Florida Marlins, New York Mets, and Kansas City Royals of Major League Baseball (MLB). Lloyd played with the Milwaukee Brewers, New York Yankees, Toronto Blue Jays, and Kansas City Royals all of the American League and the Montreal Expos, Florida Marlins, and New York Mets all of the National League. He is the third native Australian so far to have pitched in Major League Baseball, as of July 2012. Lloyd was used exclusively as a relief pitcher during his ten years in the major leagues. He ended his career with 30 wins against 36 losses, 17 saves, and 97 holds. At his peak, Lloyd threw a sinking fastball that reached 90 miles (140 km) per hour and a slider. Later in his career, he added a palmball to his repertoire. For much of his career, he was used as a left-handed specialist, or LOOGY (lefty one out guy). This type of pitcher is used against an opposing team's star left-handed hitter(s) late in a game. Lloyd excelled in this role for the New York Yankees in 1998 when he posted a career-best 1.67 ERA. This effectiveness led to the Toronto Blue Jays demanding that Lloyd be included in a package anchored by starting pitcher David Wells when the Yankees traded for Toronto starting pitcher Roger Clemens. Lloyd became the first Australian baseball player to win a World Series in 1996 while playing for the New York Yankees. The Yankees defeated the Atlanta Braves in a six-game series. Lloyd was awarded the win for Game 4 of the series, replacing Mariano Rivera in the 9th inning and forcing the left-handed batsman Fred McGriff into a double play. Lloyd became a two time World Series champion for the Yankees in 1998, defeating the San Diego Padres. Lloyd is still the only Australian baseball player to have won a World Series. Lloyd missed the entire 2000 season while recovering from arthroscopic surgery. In 2001, he received the Tony Conigliaro Award. Lloyd represented his native Australia at the Olympic Games in Athens in 2004. 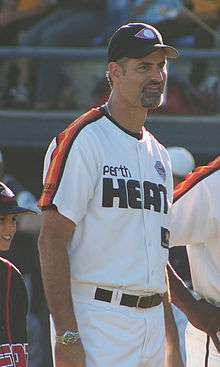 His teammate Dave Nilsson had made history with him ten years earlier, when, on 13 April 1994, the men formed the first all-Australian battery in an MLB game. Lloyd's wife Cindy suffered from Crohn's disease, which she succumbed to in 2000 at the age of 26. In 2000 and 2001, Graeme acted as the spokesman for the Graeme Lloyd and Jon Mechanic Field of Dreams, a charity which was dedicated in the name of Cindy Lloyd. He is currently the pitching coach for the Perth Heat of the Australian Baseball League. 1 2 mlbblogger on (26 November 2011). "Former NYY World Series reliever Graeme Lloyd coaches Australian Baseball League's Best: HEAT « mlbblogger". Mlbforlife.com. ↑ "BASEBALL; Yankees Have Talked to Key – New York Times". Nytimes.com. 21 February 1999. ↑ "1996 World Series Game 4 - New York Yankees vs. Atlanta Braves". MLB.com. ↑ "1998 World Series". Baseball-Reference.com. ↑ "Tony Conigliaro Award". Nndb.com. ↑ "London 2012 Olympic Games – ABC Grandstand Sport (Australian Broadcasting Corporation)". Abc.net.au. ↑ "Storm adds to trouble". Sptimes.com. 20 August 2000.